Mutt Headquarters is located in Nanguneri (Sri Vanamamalai Mutt, Nanguneri (vAnamAmalai) - 627108. Landline number: 04635-250119). To send your sambhAvanai (contributions), etc., please contact via phone or email and we will let you know the different means of funds deposit. 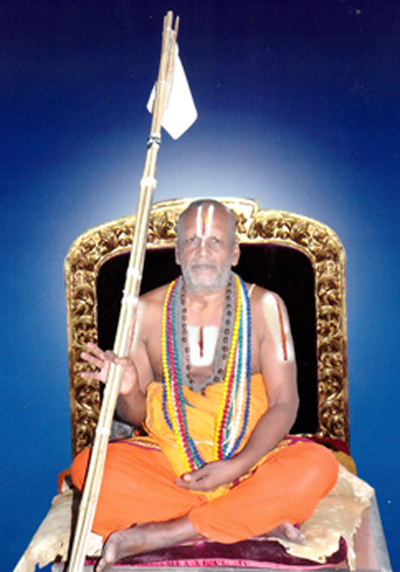 Those who are desiring/willing to undergo samAsrayaNam can contact mutt main office @ 04635-250119. During jIyar swamy's yAthrAs one can contact Narayanan swamy @ 9944434180 or Srikanth swamy @ 9442449010 in advance and confirm the timings, etc. While going for samAsrayaNam, sishyas are requested to carry some fruits/flowers to offer to mutt perumAL and jIyar swamy. After samAsrayaNam is completed, sishyas would be given mutt's thaniyan/vAzhi thirunAmam book which can be used as a guideline to recite/remember our AchArya thaniyans everyday. vAnamAmalai mutt is an ancient srIvaishNava mutt which was established by ponnadikkAl jIyar under the orders of maNavALa mAmunigaL. ponnadikkAl jIyar was the first and foremost disciple and this mutt is one of the most important mutts of srIvaishNava sath sampradhAyam. A mutt is a spiritual center where ancient knowledge strives and blossoms through regular discourses and education by learned scholars. srIvaishNava mutts are generally headed by sannyAsis and are run under the authority of them. srIvaishNava sannyAsis are generally identified as ubhaya vEdhAnthAchAryas and paramahamsa parivrajaka AchAryas. ubhaya vEdhAnthAchArya means one who has mastered both samskritha vEdham and dhrAvida vEdham with their in-depth meanings. paramahamsa means one who is like a swan which is pure and the one which can distinguish between sAram (essence) and asAram (residue/insignficant). parivrajaka means one who is a mendicant - travelling preacher. Though sannyAsis do not stay in the same place continuously, for the welfare of all beings, srIvaishNava sannyAsis, out of great compassion, stay in a mutt as allowed in sAsthram and elaborate on spiritual principles to every one. Our vAnamAmalai mutt is also known as thOthAdhri mutt in uththara bhAratham (North India). In addition to the branches here in dhakshiNa bhAratham, there are many thOthAdhri mutts in uththara bhAratham (including nEpAL). Starting with ponnadikkAl jIyar himself, many jIyar swamys from this vAnamAmalai mutt have travelled to the length and breadth of bhAratha dhEsam and have propagated the divine principles of ubhaya vEdhAntham to different regions. There have been very many great scholars amongh the jIyar swamys of this mutt. Many AchAryas and mahants in uththara bhAratham are still greatly faithful to our mutt and AchAryas. Currently, there are many establishments (dhivya dhEsam temples, mutt branches, etc) that are managed by our vAnamAmalai mutt. vAnamAmalai dheivanAyaka perumAL temple and nandhipura viNNagaram jagannAtha perumAL temple are the foremost among the dhivya dhEsams that are under the management of our mutt. So far, we have had 31 jIyar swamys decorating this most glOrious pItam which was initiated by ponnadikkAl jIyar. 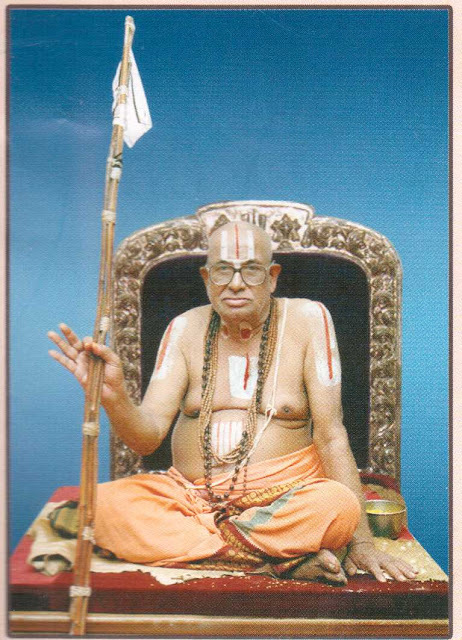 Our 30th and periya (previous) jIyar swamy is srImath paramahamsa ithyAdhi kaliyan vAnamAmalai rAmAnuja jIyar swamy who is a renowned scholar in our sath sampradhAyam. He recently attained the lotus feet of his AchAryan (ascended to paramapadham) on April 30th 2014. On the same day, srImath paramahamsa ithyAdhi madhurakavi vAnamAmalai rAmAnuja jIyar swamy (srI u. vE. nArAyaNa iyengAr in pUrvAsramam) was appointed by kaliyan swamy as his successor (before ascending to paramapadham) and ascended to the throne of srI vAnamAmalai mutt as 31st and varthamAna (current) jIyar swamy. varthamAna swamy, in his pUrvAsramam, has served our mutt from 27th pattam swamy up to 30th pattam swamy for over 45 years. We feel great joy in welcoming you to the mutt's official website, where we have lots of valuable information related to our sath sampradhAyam. We request all sishyas and abhimAnis of our mutt to kindly register themselves as member in the mutt website and be benefited in the future to be connected with and to participate in mutt activities regularly.